Theoretically, the V2 could be launched from any location where the ground was firm enough. However, the process of supply-prepare-launch called for a specialised infrastructure of railways, roads, compounds, halls with technical facilities, dwellings and above all good camouflage. The region of The Hague offered all these characteristics and was within the firing range of London. Also, near the coast was an evacuated zone, out of bounds to the civilian population, the so called 'Sperrgebiet', where buildings were intact but the inhabitants had been forced out. This diminished the chance of ‘snoopers’ near the Atlantik Wall. A fact that was also convenient to maintain the security of V2 operations. Buildings and trees provided visual cover and protected the rockets that were taking off against gusts of wind, which could change their course. For accurate aiming of the rocket, the launching site had to be surveyed precisely. These preparations started as early as the summer of 19443 in the region of The Hague. Trees which were used as measuring points were marked by a cross. Further, the stability of the ground was tested at various points. After that, nothing happened for almost a year until on September 7th a team of surveyors arrived in Wassenaar. The following day at 18.44 hrs the first V2 was launched from Wassenaar. Outline of the flat railway carriages transporting the V2s to the Netherlands. 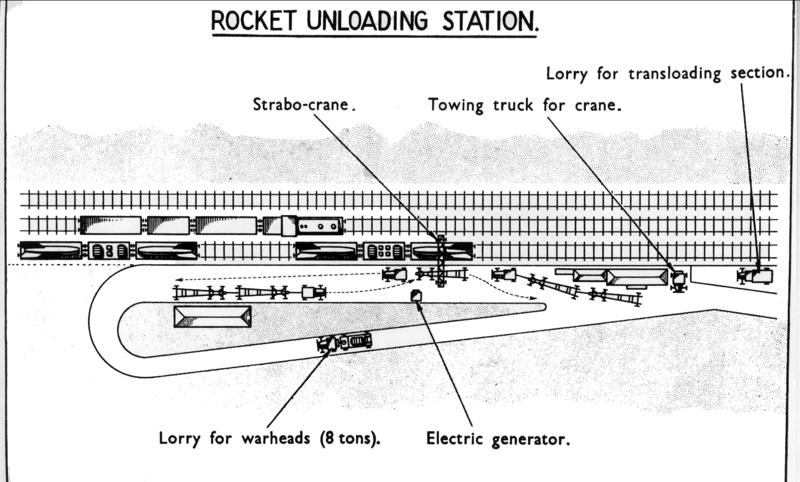 The rockets were transported on flat railway carriages directly from Germany to Leiden station; from there they were moved to the unloading place on the Herensingel. The rockets were transported in pairs on three flat carriages. The carriages were covered with sails and reed mats. Using a 15 ton Strabo mobile crane the empty rockets were then loaded from the carriages on to trailers, the so-called Vidal trailers. The explosives were transported separately in containers. After arrival the explosive war heads were taken by trucks to a safe place to await the final assembly into the rocket body. In most cases ammunition bunkers were used as safe storage places, and these were already present in the area. For example old ammunition bunkers on the Raaphorst terrain in Wassenaar and also the depot of an existing bomb-proof (ständige) Pak-bunker4 in The Hague City Forest and in Staelduin Forest. Before the rockets could be launched, they had to be checked technically: especially the vulnerable gyroscope (needed to control the rocket during launch) which could have suffered damage during transport. These check-ups were carried out in suitable buildings, containing such technical equipment as traversing hoists. The electrical tram depot in Scheveningen was used as such, and possibly the tram depot in Loosduinen as well. The revised rocket fitted with a warhead was transported on a Meiller trailer to the launching position. This Meiller trailer was of an unusual construction: with the help of a hydraulic system the rocket could be placed in a vertical position; therefore the cradle served as a launching beam. The rocket then rested with its tailfins on a launching platform. Once the rocket was in a vertical position, fuelling could start. 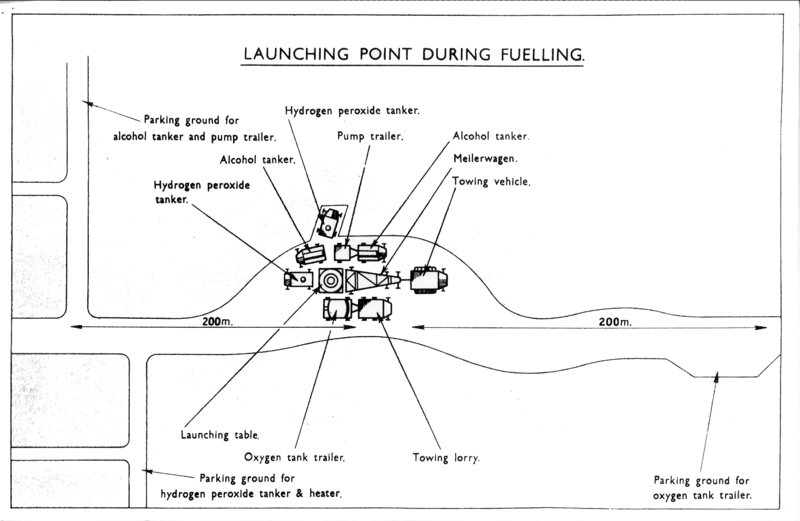 The fuel components consisted of methyl alcohol and liquid oxygen. The alcohol was transported using normal tankers. The liquid oxygen, however, was produced in Germany and was transported using special rail tankers to the firing area. Rail tanker for the transport of liquid oxygen. Sketch made by a spy of the Dutch resistance. These rail tankers were placed at Hollands Spoor railway station. From there the shuttle tankers drove via the Waldorpstraat to the PTT-platform, where the liquid oxygen was pumped from the rail tankers. Sometimes the pumping took place near the viaduct of the Valliantlaan. The rail tanker stood on top of the viaduct, and was connected with a hose to a shuttle tanker, which stood beneath. According to an eyewitness, transhipment from rail tankers took place on the Schenkweg near Staats Spoor railway station. 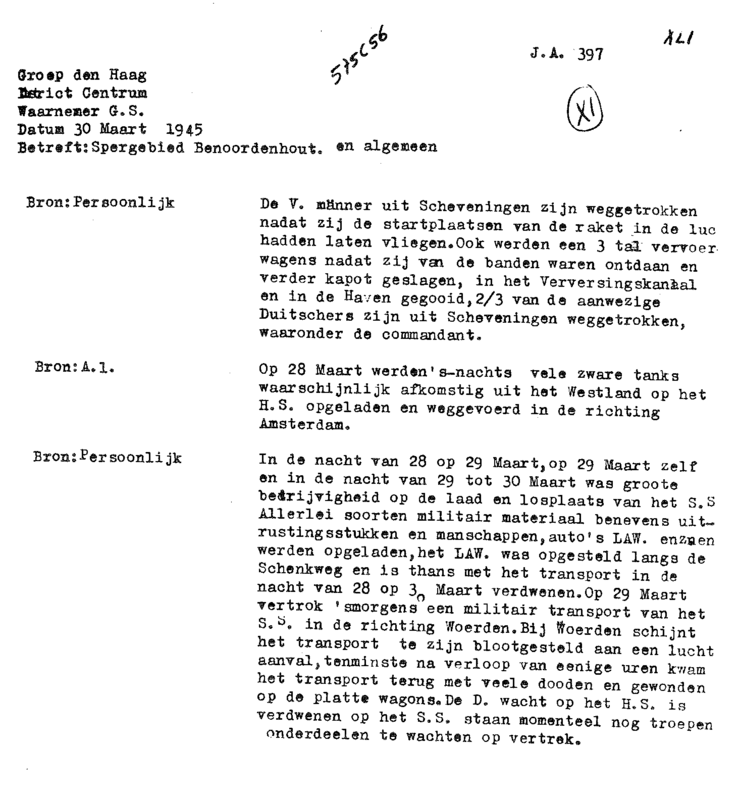 A resistance note confirms the fact that rail tankers with liquid oxygen were sent to Staats Spoor railway station. Also, in the records it was stated that these rail tankers were turned by means of the turntable, situated at the rail crossing between Charlotte de Bourbonstraat and the Lekstraat, so that the rail tankers could be brought over to the Hollands Spoor railway station and to be transferred to shuttle tankers. The rail tankers, as well as the shuttle tankers, were insulated to prevent evaporation. The fuelling was a lengthy process, which had to follow a procedure, as precise and efficiently as possible. The transportation of both full and empty tankers was precisely timed. The Germans preferred a ‘U’-shaped working pattern of roads as a launching site: two parallel roads with lateral linkages. The rockets were launched as soon as possible after fuelling. Meillerwagen with V2-rocket transported by an SWS-tractor. Fuelling liquid oxygen with a temperature of minus 183 degrees Celsius was a risky business. Because of this Polish and Czech personnel were used; if an accident occurred, all personnel were evacuated and told to drink lots of milk to prevent poisoning. There was one case, in which methyl alcohol had disappeared; it had been used by the East Europeans for their own consumption. They topped up the tanks with water instead. After the Meiller trailer had been removed from the launching area only the armoured launch vehicle (Feuerleitpanzerfahrzeug) remained behind; to give it extra protection it was partly dug in. After the last visual checks of the operation of the rocket motor, it was started and within a couple of seconds it was on full power; the rocket then started its ascent into the sky. After about 45 to 65 seconds the motor was switched off (Brennschluss), when the rocket had reached its highest point (culmination) of its trajectory; the rocket then began its ballistic trajectory in the direction of the intended target. There was one case where a rocket returned to earth just after having been fired and dropped onto the launching platform. That took place at Beukenhorst (Wassenaar) on 27th October 1944 at 14.00 hrs. The rocket attained a height of about 90 metres, when it suddenly stopped, fell to the earth and exploded. This explosion caused the death of 12 German soldiers and part of the launching area was destroyed. 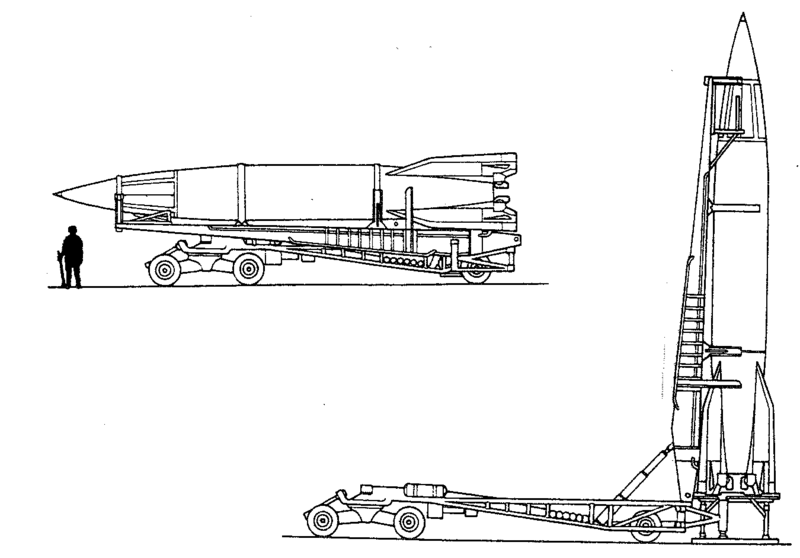 V2 rocket on Meiller trailer in transport mode [above] and in vertical position on the launching platform [below]. On 27th March 1945 the last six V2s were fired towards London. Four days earlier the British troops, under the command of Montgomery, had reached the Rhine in Germany. Because of this the V2 launch troops were in danger of being cut off from Germany. The German High Command gave the order, that all V1 and V2 operations should cease and that all equipment should be taken back to Germany. By this time the rocket troops in The Hague still had 60 complete rockets at their disposal. Most of the equipment and materials were evacuated by train, but near the Castle of Duivenvoorde a lot of spares and equipment, that could not be transported, were blown up. One Meiller or Vidal trailer was dumped into the harbour at Scheveningen. Resistance note about the leaving of the V2 troops at the end of March 19455. Boer, J.F.A. : Raketten over Den Haag. Bijdrage tot de geschiedenis van de Duitse V2-aanvallen op Londen, September 1944-Maart 1945. In: Die Haghe Jaarboek 1948/1949, p. 1-34. Boer, J.F.A. : V-wapens in Overijssel. 1951. Heijstek, P.: Te midden van bunkers en mijnenvelden. Hoek van Holland, 2002. Kenens, A.N.W. : De V-2, Hitlers geheime wapen. In: Hazenberg, F.R. ; Kenens, A.N.W. ; Krogt, W.P. van der; Lit, R. van en Neisingh, C.N.J. : Wassenaar in de Tweede Wereldoorlog. Uitgave Stichting Wassenaar ’40-’45. Wassenaar, 1995. ISBN 90-802362-1-7 geb., p. 458-501. Spaans, P.: Scheveningen Sperrgebiet. ’s-Gravenhage, 1983. Valkenburgh, P.: Herinneringen aan de V-2. In: Ons Leger, Jg. 69, No. 3, maart 1985, p. 13, 14.